Create a stunning garden feature, cheaply and easily - in a weekend. Even if you have never picked up a drill before! A beginners step-by-step guide on how to build a stunning corner pergola. 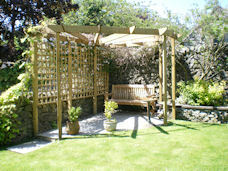 Build this stunning corner pergola easily and cheaply - in a weekend! Even if you've never picked up a drill before! A beginners detailed step-by-step guide on how to build this stunning corner pergola. The 18, free, ready to use, pergola rafter tail templates, will help to make your pergola a unique and beautiful garden feature!